I'll start this one right away by letting everyone out there know that this isn't your garden-variety Metal album. 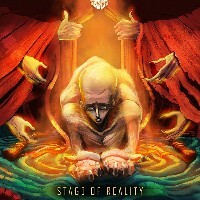 STAGE OF REALITY’s self-titled release will be a welcome surprise for those who seek something truly apart from the norm as far as the Metal scene is concerned, and this album hits hard all the way through. As one sifts through the many layers of sound contained herein, they will find themselves on a journey filled with twists and turns which seem to have no end. From heavy, crunchy riffing to crooning vocals, and from electro backbeats to visceral power chord soundscapes; to straight shooting, to-the-point lyricism and a cover song originally performed by a now dead but once beloved European pop star; one finds all of this and everything in between on "Stage Of Reality" - a record that is nothing short of fascinating. One of the aforementioned standouts is the cover of Amy Winehouse's ballad of love obstructed entitled "Back To Black"; which features the sultry yet powerful vocals of American songstress Amanda Somerville. Now, many a Metalhead is probably backing away right now at the thought of this, but STAGE OF REALITY pulls it off flawlessly, and the track bulldozes on through with the strength of some of the early works of bands such as HEART and MEAT LOAF. Much of the same can be said about the first track of the record as well, "Spectral Drum Down", which has now been turned into a wonderful music video. Yet these are just two moments where this record shines, and there is still so much more for the listener to behold. There aren't many projects that have taken their individual concepts to the very brink of imagination and pure conception in the way that STAGE OF REALITY have on this particular release. If I were forced to draw comparisons, some honourable mentions would be KING’S X, IMPELITERRI and perhaps QUEENSRYCHE in their earlier days. The music is absolutely all over the place, but in the best of ways. The vibrato vocals sweep and soar, and exhibit the talent of one who has been professionally trained in the art of singing. It is this willingness to go anywhere and everywhere musically, combined with the determination to stay true to the core elements of formulaic Heavy Metal, that make STAGE OF REALITY something special within the vast and endless world of music today. In conclusion, "Stage Of Reality" showcases quite a lot when it comes to where the future of music itself is headed. The band seems to have no fear as far as exploration and experimentation are concerned, and the result is definitely a major payoff. This entire record breaks free from the confines of the traditional and expected, opening up an entire universe of new and exciting possibilities, and treads in waters that no other groups have dared to tread in before. For those who seek adventure, talent, and something altogether above and beyond the norm when it comes to their listening pleasure, I highly recommend this engaging and multi-layered self-titled album by these purveyors of power who go by the name of STAGE OF REALITY.